Phone Bill Casinos: Too Instant? Top UK casino sites like SlotGames.co.uk have started offering players the chance to use their mobile phone bill as a payment method when making their deposits. This method is commonly known as Pay By Phone and casinos that offer this service can be categorised as phone bill casinos. Here, we’re going to discuss whether we think phone bill casinos are too instant and therefore problematic, or whether they’re simply an efficient new way of depositing funds. What Is A Phone Bill Casino? Any casino which offers the ability to make a deposit using a mobile phone can be considered as a phone bill casino. Such casinos will often advertise this feature prominently because they know that many of their players will want to take advantage of this convenience. A phone bill casino will usually offer other more traditional payment methods alongside the option to make a deposit using a mobile phone. Pay By Phone does what it says on the tin. It adds your casino deposits to your phone bill as opposed to taking the money directly from your bank account. You connect your gaming account with your mobile phone by adding your mobile phone number and services like Boku or PayByMobile do the rest. This is a really simple and secure method of making a deposit to pay for your gaming. 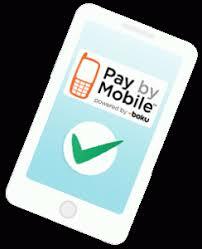 There are many reasons to use this payment method including the fact that it’s almost instantaneous. With a phone bill casino, you can also benefit from added security levels as you won’t need to give the casino any of your bank details. Although reputable, licensed casinos should offer excellent security for your banking details, you may find it comforting to altogether avoid giving these details when you make a deposit. Many people believe that phone bill casinos are too instant, and that this can be dangerous for those who cannot afford to spend a lot of money online. This is a serious concern and we urge all players to get into the habit of keeping a clear log of deposits to avoid having a surprise when the phone company generates a bill at the end of the month. Remember, if you ever feel that your gambling is getting out of control there is help available and BeGambleAware is a good place to start. Phone bill casinos can provide a secure and efficient way of paying for your gambling online but as when spending any money on gambling, you should pay very careful attention to the amount you’re spending to ensure you don’t find yourself in a difficult financial position.